Sam’s Town in Las Vegas and Bounce TV hosted a PBC card on Friday evening which featured Ladarius Miller going up against Dennis Galarza in a lightweight affair. 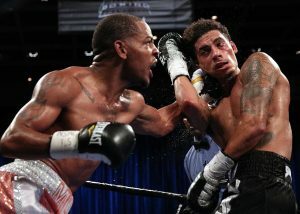 First, though, Kevin Watts, 12-2, faced off against Juan Heraldez, 13-0, in a scheduled 10 round welterweight battle. Heraldez, known as a fighter to keep an eye one, dropped his man in the very first round. Watts got up, but Heraldez was able to continue dominating throughout the first half of the fight. The man’s effective jab and solid punches were telling the tale. Watts himself began to have some success in the eighth, but it was too little, too late. Heraldez ended up taking a well deserved Unanimous Decision win. The next match featured the 22-7 Oscar Bravo and the 31-1 Sharif Bogere in a ten round lightweight match. Bogere’s more accurate and sharper punches told the tale in the first half of the match. He carried that success into the second half of the fight, as well. 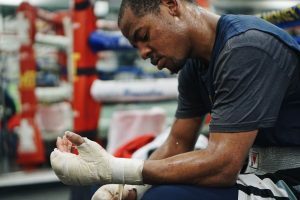 As the PBC broadcast team stated, Boegere’s jabs to the body were proving successful. Bravo came forward gamely, and actually looked rather effective in spots. Bogere, however, ended up looking like the more advanced fighter. It was no easy win, but Bogere’s Unanimous Decision victory was clearly well deserved. It was time for the main event. Miller, 16-1, entered the ring riding a seven fight win streak and with the support of Floyd Mayweather’s Money Team. The 16-3 Galarza, on the other hand, was undoubtedly eager to move on from an April loss to Edner Cherry. The first round of the scheduled 10 rounder was simply a feeling out affair. The second round was nearly as cautious in nature as the first. The third round saw Miller firing and largely missing while Galarza hardly threw any punches at all. Gatti-Ward this was not. Round four consisted of both men feinting, firing once or twice every second or so, and tying each other up. Heading into the midway point of the fight, neither man had landed close to anything telling. Things picked up in the middle rounds, with Galarza appearing more eager to pick up the pace. By the seventh, it was Galarza who was asserting himself by applying pressure on the smaller Miller. The final rounds saw a still cautious, but considerably more effective, Galarza getting the better of his man. Miller was able to contain Galarza to some degree with his jab, but he was never able to assert himself or mount anything impressive. Surprisingly, Miller walked out of the ring with a UD win. As a walkout bout, the undefeated 4-0 Rolando Romero engaged in a scheduled six round lightweight affair with the 4-4 Javier Martinez. A stand up and fight boxer, Romero attempted to dominate his foe, but Martinez was more than willing to engage. Romero was still able to walk away with a UD win. Galarza, an outstanding amateur boxer, stepped up in competition and dropped a narrow decision to veteran contender Edner Cherry in April. 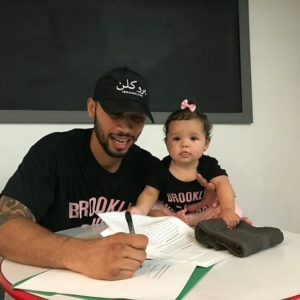 The 25-year-old Galarza, who’s from Brooklyn but trains in Orlando, had won three straight fights heading into that bout and will look to get back in the win column in the same building where he won a 10-round decision against Omar Tienda last June. Al Haymon’s Premier Boxing Champions (PBC) seems to have slowed down on the number of shows that they put on recently, but they put on a card from the Buffalo Thunder Resort and Casino in Sante Fe, New Mexico. The opening bout of the night was between Dennis Galarza (13-1)and Cesar Alan Valenzuela (12-4-1) in the Super Featherweight division. Galarza had the height advantage but Valenzuela had the reach advantage. Valenzuela had Galarza caught near the corner in the first minute of the opening round and was able to land a good shot to the head and body of Galarza. There was a good exchange in the final seconds of the opening round, but Valenzuela was pressing the action. Galarza took control of the center of the ring in the second round and used his jab to control the positioning of Valenzuela. There wasn’t a whole lot of action, but Galarza appeared to be the busier fighter. Valenzuela was more effective in the third and fourth rounds and was able to land the cleaner and harder shots. Galarza was too passive and appeared to be heistant to throw more than one punch at a time. Valenzuela landed some very good right hands in fourth and fifth rounds and looked like he was taking over the bout. 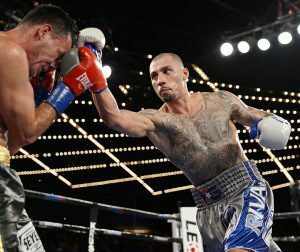 Galarza tried to get in tight and impose his will in the sixth round, but he wasn’t able to get much of an offense going. Galarza most likely won the seventh round as he had Valenzuela moving backwards most of the time, and both fighters looked exhausted by the final round. The fight was close and many rounds could have been scored either way, but the judges scored it 77-75 Valenzuela, 77-75 Galarza, 77-75 for Valenzuela giving him the split decision victory. The next bout of the night was in the super lightweight division between Ryan Karl (13-0) and Jose Felix Quezada (11-0). Ryan Karl has knocked out five straight opponents heading into this match. Quezada and Karl came out firing in the opening round and Quezada was sharp with his check left hook early on. Karl was throwing more combinations than Quezada, and had him hurt with right uppercut to the chin that wobbled the knees of Quezada. Karl went for that uppercut several more times and was able to score a knockdown after cracking Quezada with a right cross. Quezada was able to get back to his feet as the round came to an end. Karl landed several hard right crosses in the second round and took the best shots of Quezada well. Quezada had a better thid round and was able to land some check left hooks, but Karl dominated in the fourth round. Karl landed several hard right crosses in a row near the end of the fourth and had Quezada’s face bleeding badly. Quezada finally went down from one final right cross and was on wobbly legs when he rose to his feet. Quezada stumbled to his corner and the end of the round and the fight was stopped before he could come back out. Ryan Karl wins by TKO at the end of the fourth round on the advice of the corner of Quezada. 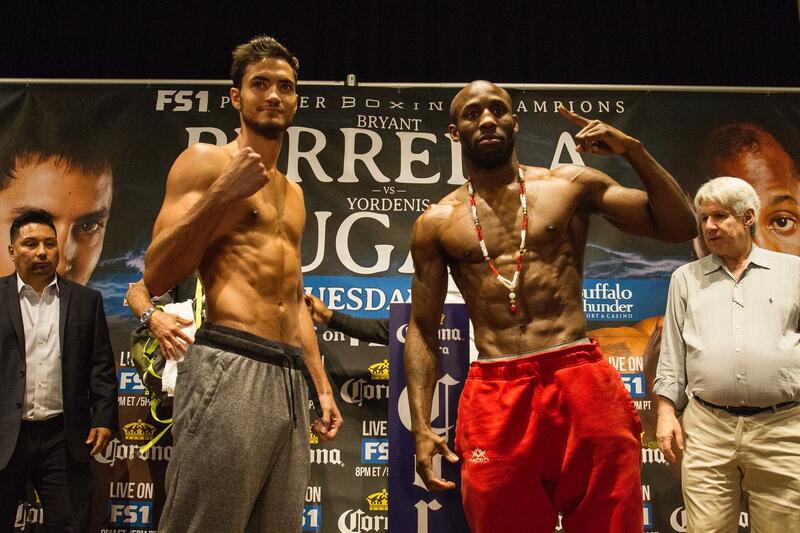 The main event of the evening was between Bryant Perrella (14-0) and Yordenis Ugas (16-3) in the welterweight division. Perrella had the height and reach advantage, but Ugas was by far the more experienced amateur. That experience showed early on, as Ugas landed an early over the top right hand on Perrella that sent him to the canvas. Perrella was able to get back to his feet, but Ugas stalked Perrella the remainder of the round and was looking for that right hand bomb. Ugas was touching the body with a jab in the second round and was sharp with his right hands to the head. Perrella looked outclassed, and the difference in amateur experience was becoming more apparent. Perrella started off strong in the third round, but likely lost it when Ugas landed a thudding right hand that had Perrella hurt as the round came to an end. Perrella scored another knockdown in the fourth round when he landed a perfect right hand that sent Perrella crashing to the mat. Perrella showed incredible heart and got back to his feet, but Ugas jumped on the still hurt Perrella and unleashed combinations on him by the corner and forced the referee to jump in and stop the bout. Yordenis Ugas wins with an impressive TKO stoppage at 2:20 of the fourth round.